CrunchBang Linux – is a debian based GNU/Linux distribution that is based on a very simple and efficient (and lightweight) window manager – Openbox. CrunchBang uses Debian as a package base (similar to the Ubuntu way) so if you are familiar with any debian based distro such as Ubuntu, Linux Mint then you can get started with CrunchBang in no time. CrunchBang focuses on simplicity and speed (obviously, it uses Openbox instead of heavy desktop such as Gnome or KDE). Why should you try CrunchBang ? 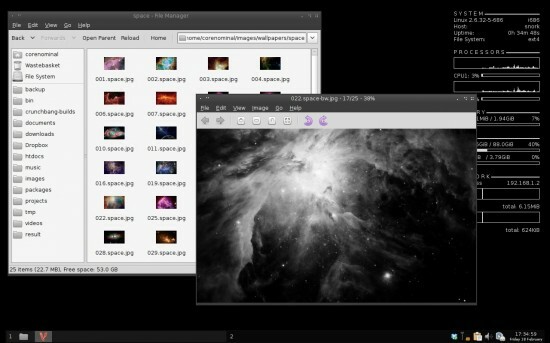 Speed – it chooses Openbox, thunar (file manager) and other lightweight programs that just works. Ease of use – it comes with all the basic stuffs that a new user would want – so it’s beginner friendly. easy to customize – after all, it’s a GNU/Linux distribution so it doesn’t seem so surprising. So CrunchBang seems to be a great distribution for the power users or programmers or those who prefer speed and simplicity over the bloated/complicated features. CrunchBang is available for both 32 bit and 64 bit architectures, and the installation process is quite similar (you can try it without installing but it would be better if you install it on your hard disk).